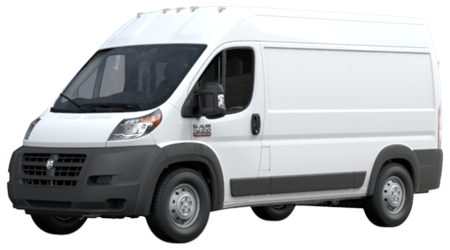 If you’re in the market for a commercial-duty, full-size van with the space and versatility to handle the needs of your business, the 2015 Ram ProMaster van should already be on your short list! While the Ram ProMaster Cargo and Window vans are all about business, you don’t have to sacrifice the comfort and convenience features that make a full day at the wheel more manageable. If you live near Savannah and Baxley, GA and want to know more about this versatile lineup of Ram vans, stop into Woody Folsom Ram in Baxley. Our dedicated team of sales professionals will give you a tour of all of the features of the 2015 Ram ProMaster Cargo and Window vans. Every 2015 Ram ProMaster Cargo and Window Van comes standard with award-winning 3.6 liter Pentastar® V6 engine, which delivers 280 hp and 260 lb-ft of torque to the front wheels. The available 3.0 liter EcoDiesel engine provides a powerful 295 lb-ft of torque and 174 hp. Towing and payload capabilities for both engines are rated at an impressive 5,100 lbs and 4,420 lbs respectively. The 2015 Ram ProMaster Cargo and Window Vans have all the versatility and cargo room that you’ll need for operating your business out on the road. Visit Woody Folsom Ram to explore the Ram ProMaster Vans further -- we proudly serve the Pine Grove, Graham, Dublin, Savannah, Jacksonville, and Brunswick, GA areas. Our showroom is conveniently located at 859 Golden Isles W in Baxley, GA.